Greenland Hand Cream / Gee Whiskers! I really love hand cream. I apply hand cream each and every time I wash my hands so when I got this amazing hand cream from Greenland I was very excited. Greenland is a new product range that Edgars has brought to South Africa. What makes this brand special is that all the products are natural and the price tag that accompanies each product is very reasonable. The cream is incredibly light and perfect for everyday use. It absorbs very quickly and doesn't leave any heavy residue on your skin. It comes in a beautiful tin holder that makes it a real treat to use. 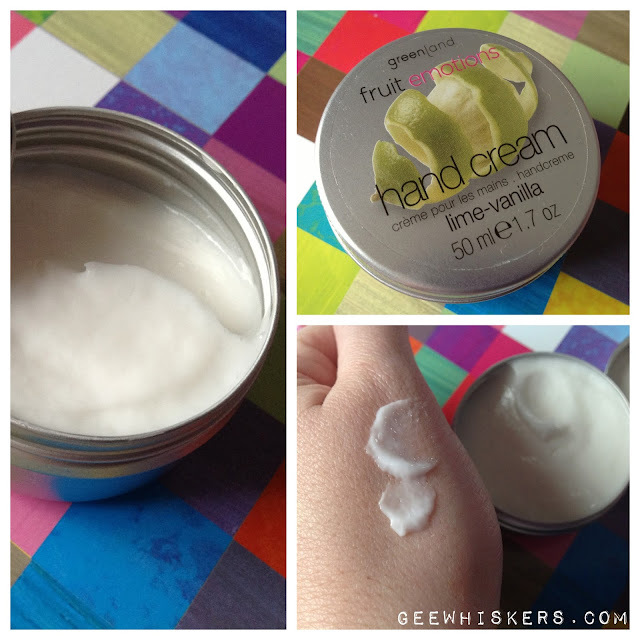 My hands look and feel beautifully moisturised after use and the feeling last a good few hours. The scent is a wonderful mix of lime and vanilla. It is so difficult to explain but I pretty much think that it is like Lime ice cream. It is such a delicious smell and I keep sniffing my hands...I know that sounds weird, but it is so good! Get hold of Greenland products from selected Edgars stores and Red Square stores. Sounds divine, the lime & vanilla scent sounds so yummy! Great review. I must get some of this. It sounds great. I love the vanilla / lime combination, it must smell amazing!